The Aluminum Tripod Base from VariZoom is made to turn the Chickenleg monopod into a Chickenfoot monopod. It can also be a replacement part for the Chickenfoot monopod. By adding the tripod base to your Chickenleg monopod, you get a compact and lightweight support that offers the portability and quick setup of a conventional monopod, with the added stability of a tripod base. It will add 3" to the height of your monopod with its legs in their widest position, and 8.5" of added height in their highest position. 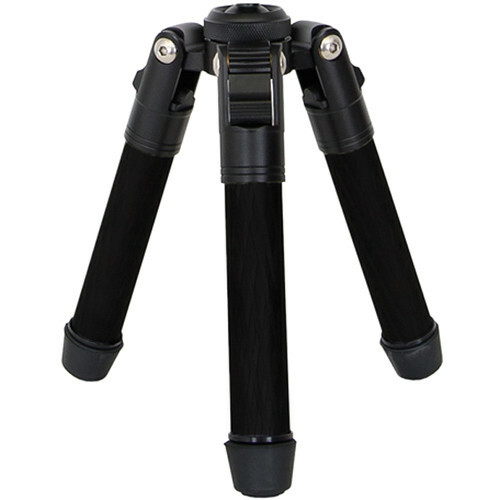 The tripod base connects to the monopod section with a ball joint that allows smooth re-positioning of the monopod so you can capture any angle needed. Adding the tripod base will allow your Chickenleg to operate as a tripod/monopod, basic handheld stabilizer, telescoping handheld boom for small cameras, or even a stand for small lights and microphones. The tripod base folds up for transport, and locks down into 3 positions for flexible configuration. The adjustable rubber tripod feet twist out for leveling adjustment, and spiked feet are included for added stability on different surfaces. Compatible with the VariZoom Chickenleg and Chickenfoot monopods. Box Dimensions (LxWxH) 8.2 x 6.4 x 4.6"
This product is only compatible with the VariZoom Chickenleg. will this fit on a benro a48, i seem to recall someone saying it did? No, this won't work with your monopod. dose the piovet ball lock? The pivot ball can lock by turning the monopod while it is secured to the base. What is the connection from the tripod base to the monopod. Is it threaded? Would like to use as a very low tripod, attach a ball head to it. The is a 3/8 -16 threaded screw ... Hope this helps you ..
What size is the female thread on the top of the tripod to accept the monopod?